Experience the rich, creamy flavor of our Warm Salmon Dip. 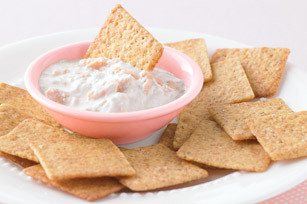 Our Warm Salmon Dip requires only two ingredients and takes just five minutes to make. Combine salmon and cream cheese in microwaveable bowl. Microwave on HIGH 1-1/2 min. or until cream cheese is completely melted and dip is heated through, stirring every 30 sec.